Stargazer Stitches by Kendra’s Customs! If you are stargazing tonight, as you look up to the night sky, you might catch a glimpse of the unique constellation – Stitches. This Stargazer Stitches sight is definitely worth the pleasure it will bring to your eyes. 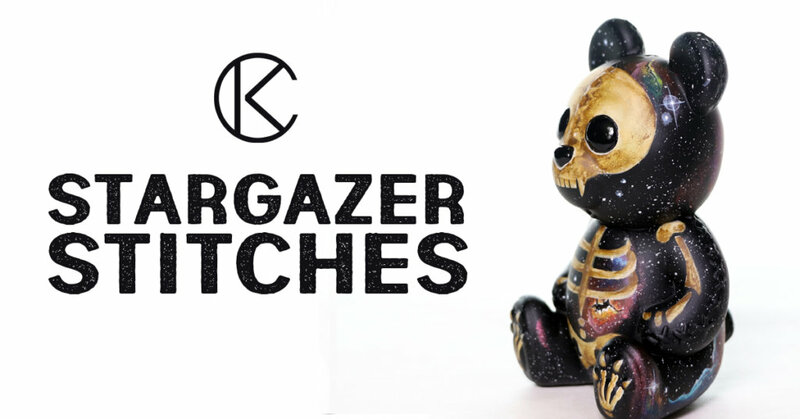 If you haven’t already gathered, Stargazer Stitches is a custom resin figure by Kendra’s Customs. Kendra’s original sculpt hand-painted by herself for a special event being held by the Facebook group – Designer Toy Universe – to celebrate the upcoming NFL Superb Owl event at the beginning of February. Stargazer Stitches joins a host of other Designer Toy pieces that can be won on February 2nd via the DTU FB group, which you can find HERE. Combining sports, art & winning. DTU are looking to fill 100 spots worth $10 per spot. For $10 you are allocated a square and during the Superb Owl game on 2/2, at four intervals if your square falls on the exact score of the game you will win the prize that was allocated to that interval. Seems pretty straight-forward to those that have any sports interest, but for those that don’t there is a short video explaining the process, which you can watch below to get the jist.